Timeless, modern, functional design items are always on the subject and in Scandinavia we are used to decorate a trendy, light and minimalistic. In a serene home there is often a need of eclectic elements which contribute to a balance between a personal style and the stylistically pure. Timeless but also stylish combinations in terms of leather and wood, or glass and metal, are always safe along with investing in design icons such as chairs, armchairs, tables and sofas that lasts over time. With decorative objects like candlesticks, vases, books, ceramics, lithographies and lamps you can easily get a personal vibe – and remember, dare to mix high and low! Italian classics from the 70s are without doubt a perfect match with French modernism and Danish design. Add different textures and materials, or add an accent color, and you will have a homey, eclectic and personal home! 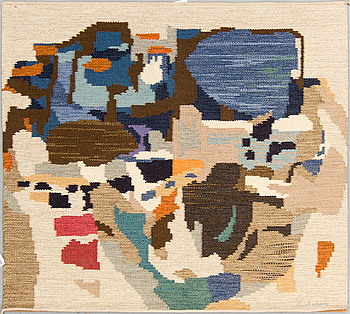 INGEMAR CALLENBERG, tapestry, flat weave, signerad I. Callenberg. Around 121 x 138 cm. 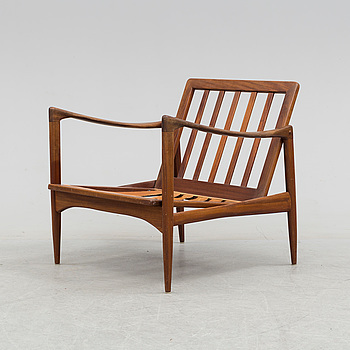 An 1960´s teak frame for an easy chair by Ib Kofod Larsen. 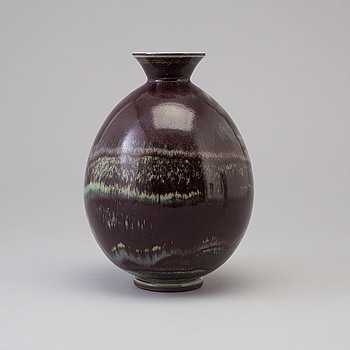 BERNDT FRIBERG, a stiöneware vase from Gustavsberg studio, signed. BERNDT FRIBERG, a stoneware vase and bowl from Gustavsberg studio, the vase signed. 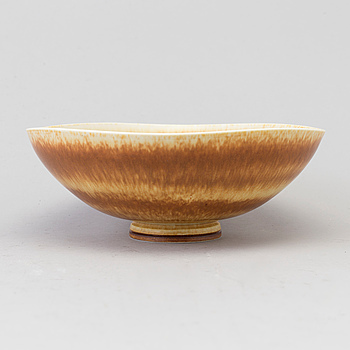 BERNDT FRIBERG, a stoneware bowl from Gustavsberg studio. BORDSLAMPOR, ett par, modern tillverkning. 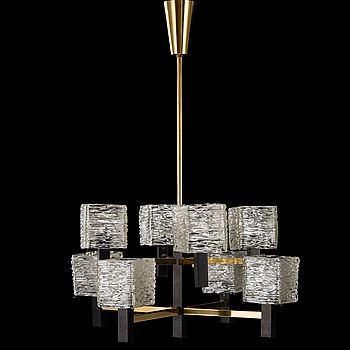 A 1960s brass, painted metal and glass chandelier. 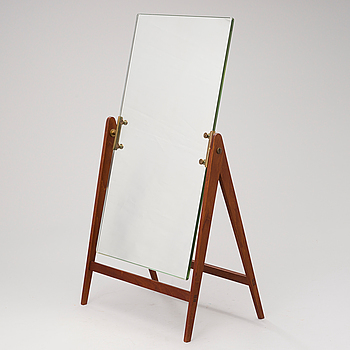 A mid-20th Century table mirror. 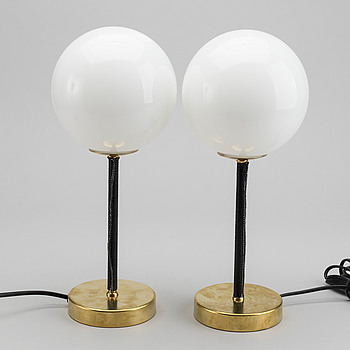 A mid 20th century '9222' table lamp for Idman, Finland. TWO LATER 20TH CENTURY ARMCHAIRS. A mid 20th century sterling silver cup/bowl by Sigvard Bernadotte for Georg Jensen 1933-44, Denmark. An art deco style table from the 1940s. A pair of 1960s/1970s stools by Gustav Axel Berg. A 1960s 'Four-leaf clover' stool for Oy Stockmann Ab, Keravan puusepäntehdas, Finland. A TABLE LIGHT, model 9222. Manufactured by Taito Oy. A pair of 615 chairs with leather upholstery, mid-20th Century. A pair of sang de boeuf vases, 20th cenutry. CARL HAMMOUD, a lithograph, signed and numbered 19/60. A pair of candlesticks for Kultakeskus, Finalnd. CHARLES & RAY EAMES, chair DSR för Vitra. 'The Smiling Chair'/ 'CH-07' chair by Hans J Wegner, for Carl Hansen & Søn, Odense, Denmark, designed 1963. A set of two 1970s hanging pendats model 961-180, for Stockmann Orno, Finland. A 1950s model 9068 ceiling light. PABLO PALAZUELO, colour lithographe, unsigned, from Derrière le Miroir nr 137 1973. STURE JOHANNESSON, colour serigraphe, signed. SAM LARSSON, a pair of armcharis "Sam" for DUX. 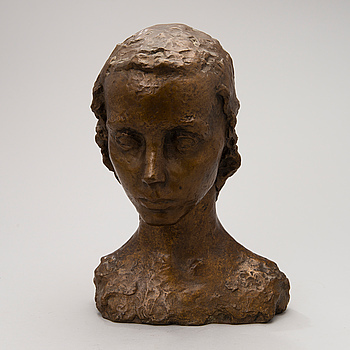 A Hertha Hillfon glazed ceramic sculpture of a head-scarf, Sweden. CHARLES & RAY EAMES, four 'Eames plastic Chair DSW' from Vitra, 2003. A pair of end of the 20th century 'Sven' chairs by Mats Theselius for Källemo. a 'Supercirkel' table by Bruno Mathsson / Piet Hein, late 20th century. a set of 5 glass vases by Gerda and Asta Strömberg, Strömbergshyttan. Two glass vases attributet to Gunnar Nylund, Strömbergshyttan, second half of the 20th century. A walnut and tubular steel table, 1930's. Two 'Z-Down' Chairs for Engelbrechts, Denmark. INGER EKDAHL, a tergo signed painting 88. HELMUT NEWTON, book, "Sumo", Taschen, Monte Carlo 1999, limited edition 06257/10000. ALEXIUS HUBER, signed mixed media. ANDRÉ BRASILIER, lithograph, signed, numbered 57/80. With dedication. A 1940's/1950's earthenware vase by Anna-Lisa Thomson, Upsala Ekeby. Two late 20th century 'Maija Suspension' pendant lights for Santa & Cole. BERTIL BERNTSSON, signed painting 84.
a pine wood dining table by Roland Wilhelsson, latter part of 20th century. A table by Jonas Bohlin for Källemo in Värnamo, model "Concrete", late 20th century. 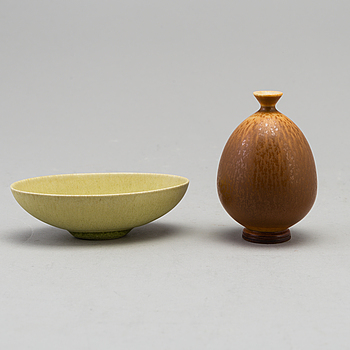 A second half of the 20th century stoneware bowl and vase by Gunnar Nylund for Rörstrand. a 'Kevi' office chair by Jørgen Rasmussen, Denmark, 1970's. A 'Tolomeo Mini' table light by Michele De Lucchi and Giancarlo Fassina, Artemide, Italy. ANDERS WIDOFF, oil on canvas, signed and dated 82. A "Rocker chair" by Chales and Ray Eames for Herman Miller, second half of the 20t century. A second half of the 20th century 'Maralunga' sofa my Vico Magistretti for Cassina, Italy. ANNA-LISA THOMSON, an earthenware table light from Upsala-Ekeby. AN ARMCHAIR ATTRIBUTED TO FLEMMING LASSEN. KAARE KLINT, a couple of armchairs "Safari chairs". ERWIN OLAF, photograph signed Erwin Olaf and numbered 2/2 on verso. STEN DIDRIK BELLANDER, silver gelatin print, signed. NIELS GAMMELGAARD, an 'Oti' easy chair from IKEA. A GLASS TOP COFFEE TABLE SECOND HALF OF 20TH CENTURY. A SET OF 6 ARNE JACOBSEN "SERIES 7" CHAIRS, Fritz Hansen. A ceiling lamp by Rody Graumans for Droog Design in Holland, designed in 1993. TORD BJÖRKLUND, a pair of 'Klinte' tubular steel easy chairs from IKEA. GUNNAR NYLUND, vas, stoneware, signed, Rörstrand, second half of the 20th century. HÅKAN BENGTSSON, ink drawing, signed atergo. A SET OF 4 GLASS SHELVES. AN EERO SAARINEN "TULIP" SIDE TABLE, Knoll International. AN ARNE JACOBSEN "THE ANT" CHAIR, Fritz Hansen. CHARLES & RAY EAMES, a 'Soft Pad Chair EA 208' from Vitra, circa 2015. CHARLES & RAY EAMES, a 'Aluminium Chair EA 104' from Vitra, circa 2015. ELLSWORTH KELLY,ELLSWORTH KELLY, färglitografi, from Derrière le Miroir nr 149 1964. PAOLO PIVA "ALANDA" COFFE TABLE, B & B Italy. 3 HARRY BERTOIA BAR STOOLS KNOLL INTERNATIONAL. A Djadjim from Kurdestan, 350 x 255 cm. An Art Nouveau creamware vase, probably Rörstrand, circa 1900.